Since our launch in April 2002, we have worked hard to provide the best rating system possible, while still looking to continuously improve upon our methodology and provide more and better information for our users. The following describes how our rating system has evolved over the years. Our initial launch in April 2002 utilized our CN 1.0 methodology, which scored organizations based solely on financial information available on their annual tax returns. Included in CN 1.0 were metrics regarding both financial capacity and efficiency. In September of 2011, we introduced a new dimension to our methodology, designed to score charities on more than just their financial health. This dimension, called Accountability & Transparency, looked at the governance of each organization, and included metrics that spoke to how an organization functioned, rather than simply how well it performed financially. Accountability & Transparency was weighted equally with Financial Health. On June 1st, 2016, CN launched its enhanced Financial Health rating methodology. This change came about after years of research and feedback collection from charities, independent advisors, and our own internal data collection. 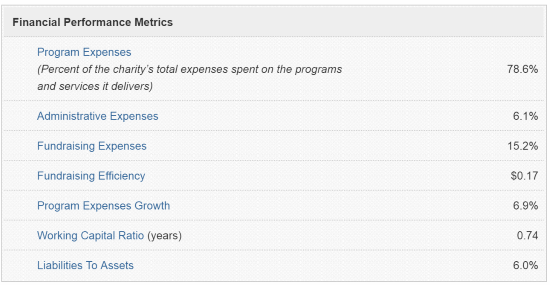 CN 2.1 better captures an organization’s long-term capacity and health by allowing for higher scores in program expense, removing the volatile primary revenue growth metric, including three-year averaging for non-capacity metrics, and introducing a new capacity metric, Liabilities to Assets Ratio (compare the new Financial Health rating metrics to the prior metrics).